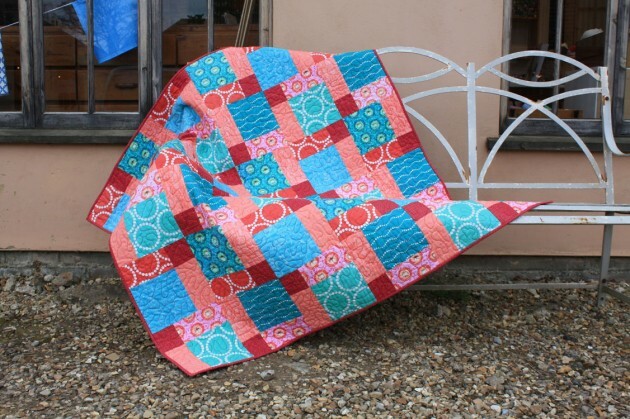 This disappearing nine patch quilt is currently hanging in our Burwash Manor shop. 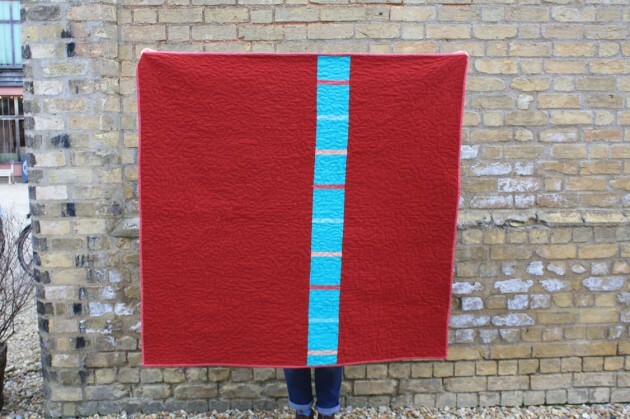 We have donated the quilt to the Cambridge Calais Refugee Action Group and the Cambridge Refugee Resettlement Campaign who are working together on a fundraising event taking place on Friday 15th April 2016 in the Guildhall in Cambridge. Please do come along and maybe even place a bid on the quilt! If you would like to place a bid on the quilt before the event you can do so by contacting Backstitch on 01223 778118, via our contact form or pop in and place your bid in person. We need to know your name, email address, telephone number and your highest bid. The quilt is 51" square. 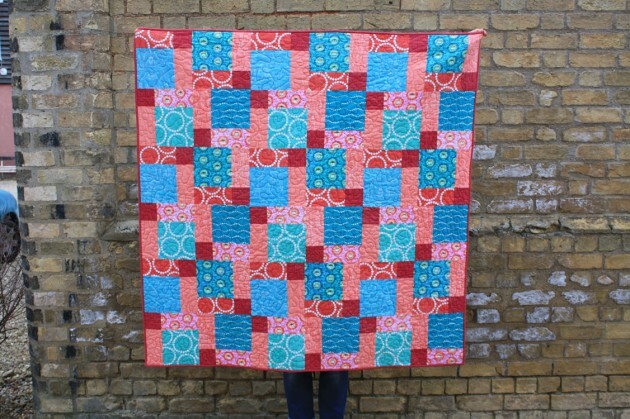 The top is pieced in 100% quilting cotton in the colours aqua and coral using a disappearing nine patch block. it is backed in a deep red linen cotton blend. 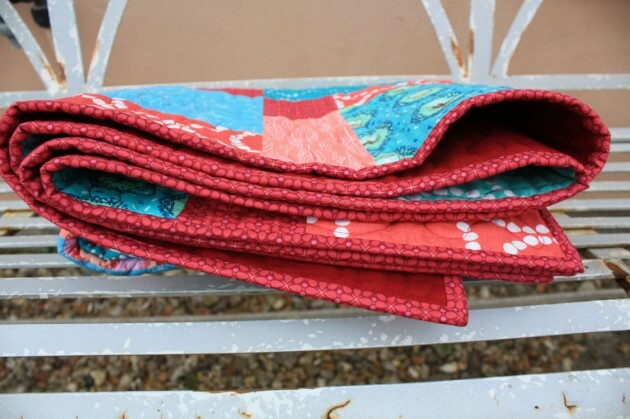 It is free motion quilted using a stippling design. 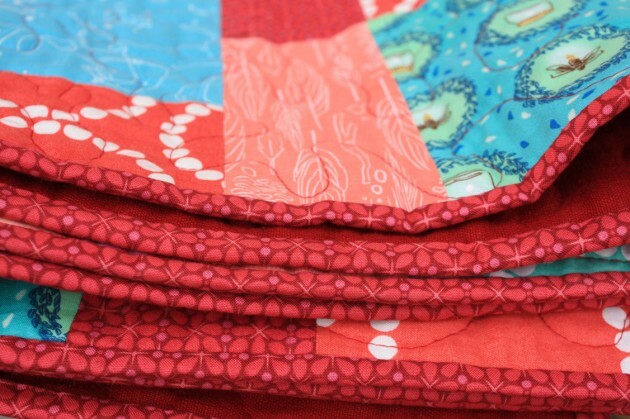 You can also read a little about designing this quilt here. The fundraiser starts with a procession at 4.30pm and then continues in the Guildhall. Between 5pm and 8pm there is a fair and exhibition, speakers and discussion and then a fundraising auction at 7.30pm. From 8pm there is an evening of music which looks like a stack of fun. Before 8pm the event is free and after it is £10/£15. Tickets can be bought through eventbrite.